Where Is STARDUST Right Now? The NASA Spacecraft landings in Utah will bring 'unknowns' to Earth. Lets all hope 'Faster', 'Better', 'Cheaper', works this time! Will our first contact with ET be an extraterrestrial disease? They have the option of waiting for the probe to run out of propellant however CNN reports that there will be a more spectacular finish for their venerable piece of property. NASA has decided to kill the Galileo probe by deliberately crash landing it on Jupiter. It also has been discussed that when the probe gets it's marching papers that it could be crashed into the Volcanic moon Io but definitely not Europa. 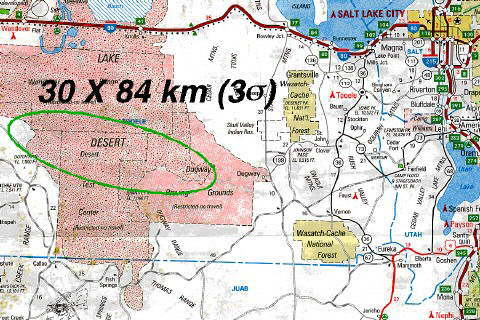 "None Dare Call it Paranoia: The Ground Zero S-4 Investigations"
Two spacecraft carrying extraterrestrial samples are to land in Utah's west desert. The collected particles, stowed in a sample return capsule onboard Stardust, will be returned to Earth for in-depth analysis. 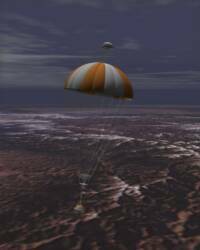 That dramatic event will occur on January 15, 2006, when the capsule makes a soft landing at the U.S. Air Force Utah Test and Training Range. The microscopic particle samples of comet and interstellar dust collected by Stardust will be taken to the planetary material curatorial facility at NASA's Johnson Space Center, Houston, Texas, for analysis. bringing with it the first comet samples in the history of space exploration." Outside above Salt Lake City, its seriousness is quite clear, the capsule is not slowing down, in fact its going to.......BAM! ,,,,,,,the capsule just hit the Army helicopter and exploded!... as the shock wave is felt by the entire Wasatch Front.... debris falls over West Jordan area towards the Oquirrh mountains, and beyond for the whole valley to see. The sky is teeming with activity, Jets are heard but not seen, Helicopters are everywhere. For a few minutes, several UFOs are seen traveling the same flight pattern as the capsule, sirens wail from every possible location as fiery debris continues to slowly fall over thousands of homes and businesses. There is no Major panic. The area is contained.. somewhat...... Days later, thousands of home video's of the event / disaster are being shown, some very disturbing. Some showing the UFO's. A strange and mysterious smell becomes present and starts to become stronger as temps hit above 90* again. POINT: We don't know what's out there. After hardening, the giant discolorations, or organisms, burst open to release trillions of spores that shoot into the stratosphere and settle over the entire planet. Within days, rainbow colored mushrooms a foot high, with the most delightful scent and taste, sprout in every nook and vacant patch of land. Subconsciously, these life forms send out a powerful unheard message, to all living things on Earth, an irresistible urge so to speak, to eat the mushrooms. The kicker,....The consciousness shifting power of these fungi transforms human consciousness -- instantly, ushering in a true golden age of peace and understanding. Hollywood would like the first scenario, we all would gladly accept the later, I would think. Genesis Space Retrieval Project scheduled for September 2004 in the West Desert.